So I had 20 minutes to complete this card to night. My first stop was my coloured images file. This little guy/gal? caught my eye and I started to trim the edges of the panel. In my haste, I chopped off too much leaving a scant 1/8” border which, of course, looked stupid! So I had to quickly cut it out, there goes one fifth of my time! Ahh! I thought the bear looked sort of vintage and I had no time to search for paper so I checked out the few paper packs I have in my cardstock box right under my stamping table and another score! I found Parisian something or other from SU! and I was on my way. Right on top of my lace jar was the lace I used and it went on lickety split with Tim Holtz tiny attacher. The staples are so small, 1/4” long, they are seriously hard to see! The one only shows because the light catches it. Click on the photo to enlarge it and find the other two! This is where my interpretation of the sketch went quite awry! I was going to center the image with ribbon underneath. But I had no blue ribbon I liked. Only a grosgrain matched and it wasn’t vintage enough for me. So I looked on my shelf to see my 1.5” (or is it 1.25”) silk ribbon from May Arts. Well that makes too big a bow for the image to be centered anymore. SIGH… but I had to finish this card and quick. So on it went with a bow made with my Bow Easy. The wings are double foam dotted so they tip forward a bit. If I had more time, I would have added gold glitter to the edges of the wings, I may yet do that. Oh and add some sponging. So I guess this whole story is to make you feel sorry for me and just enjoy the card while ignoring my complete lack of relevance to the sketch! On top of that, I have a nasty headache caused by driving behind an ambulance with its extremely bright lights on for over 10 minutes. Even dropping back a bit, the lights were burning my eyes; I am glad my lupus doesn’t cause seizures. It was travelling pretty much the speed limit on a very low traffic road, it really could have shut the lights off for most of the way except at intersections. Before you criticize, remember, I am the wife of a paramedic! I know they can shut off lights when there is no traffic in the way, at least in the services around here. 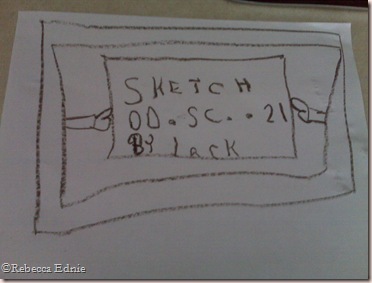 So I know you ALL can do a much better job at the fun sketch by Jack this week than I did! Thanks Jack! I am looking forward to seeing how you all and the Team interpret those little heart shaped thingies right next to the main panel, you know, those ones I ignored! (ooops) Be sure to link up your card with Mr Linky and if you upload to an online gallery, be sure to use keyword DDSC21! I think we are supposed to announce our sponsor for this month next week. Please visit all the DareDevils, links on my sidebar, and leave them some lovey comments. I can’t wait to show you some more of hte things I have been making for my craft sale. I have been having trouble finding time to blog them. Next week, you are going to have a post everyday I hope and sometimes maybe two because I feel I have to make up some posts for all you long-suffering readers out there who stuck with me through a depressing, almost post-less January. Previous postI am so busy! This is so sweet. I love the bear. Great job! 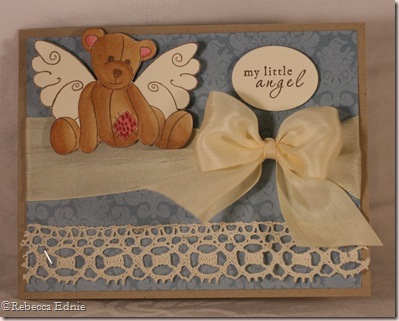 Such a pretty card, Rebecca!